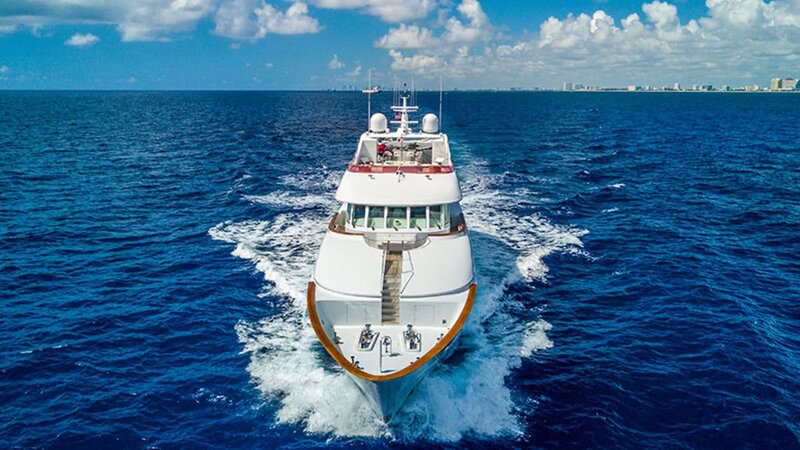 Motor Yacht RELENTLESS is a large luxury yacht which was launched in 2001 by Trinity Yachts and refitted in 2018. 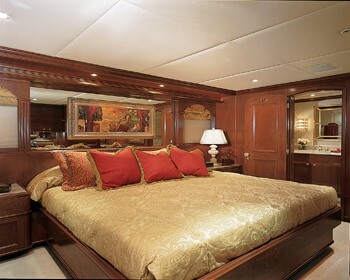 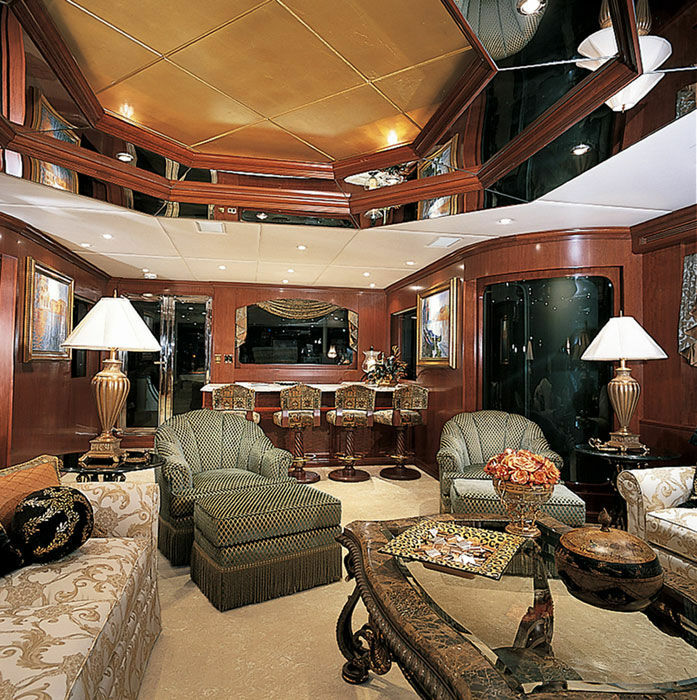 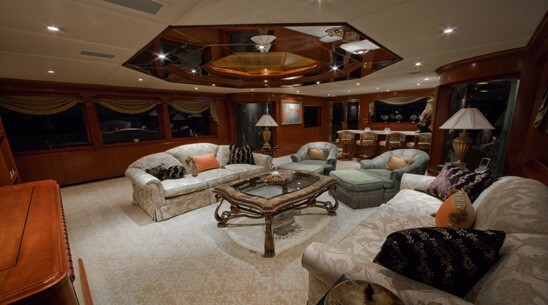 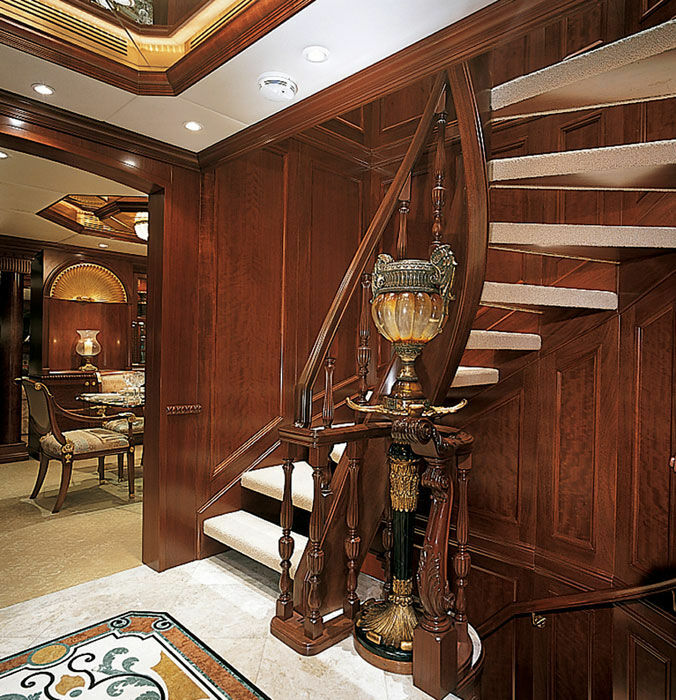 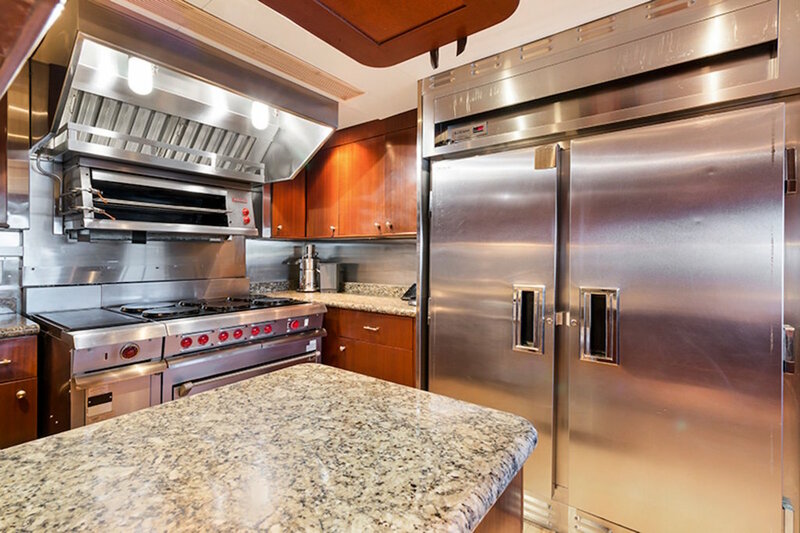 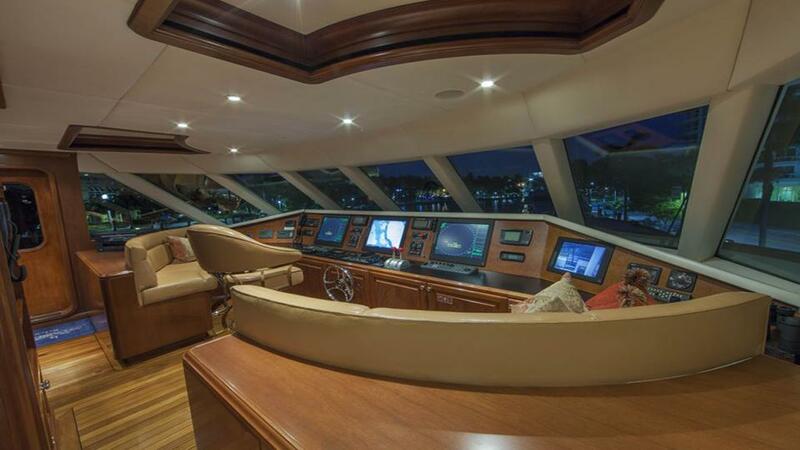 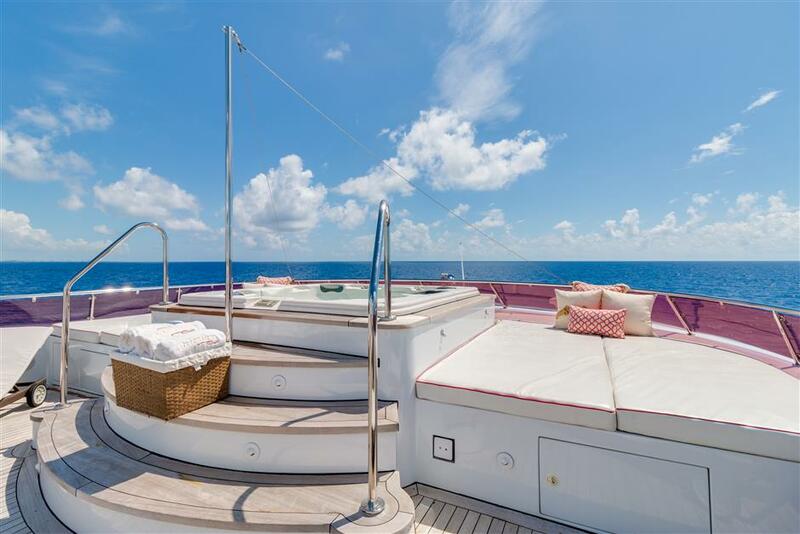 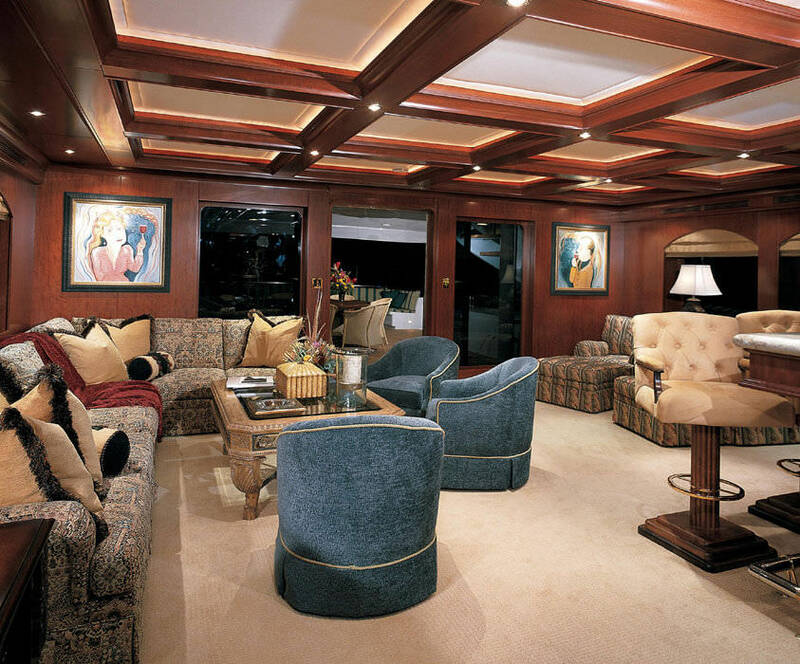 Her interior is generous and classically elegant while her exterior decks are relaxing and functional. 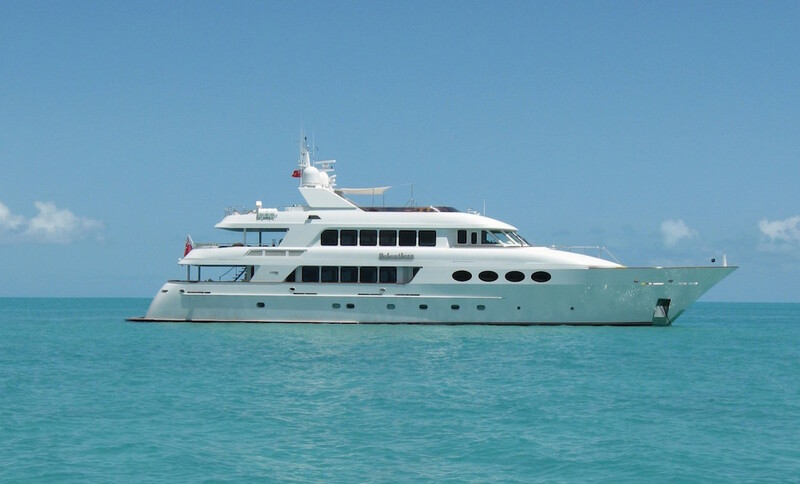 She is in excellent condition and offers accommodation for 10 guests. 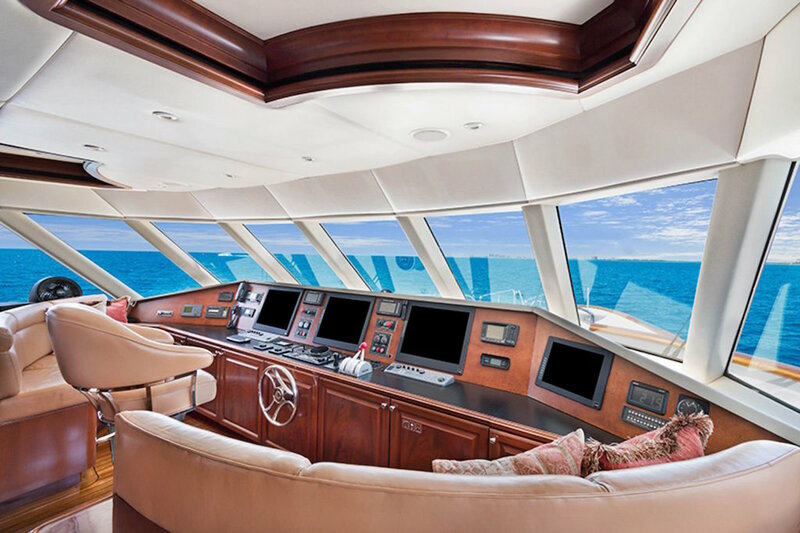 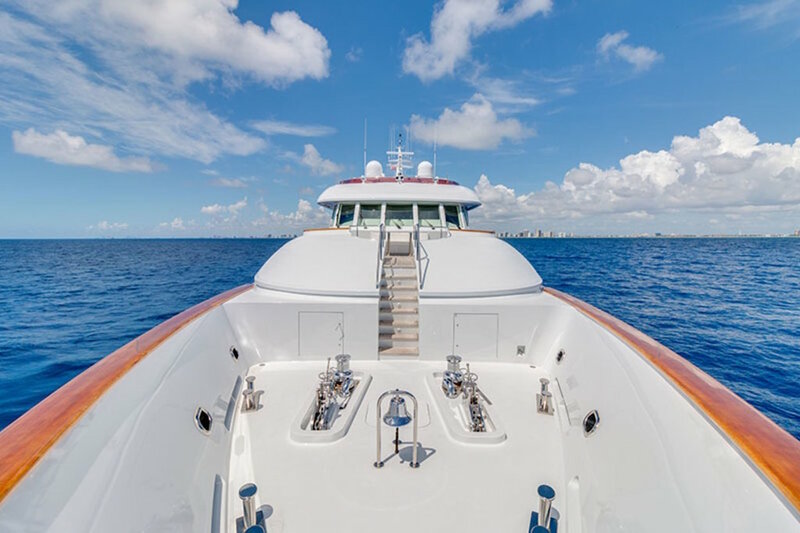 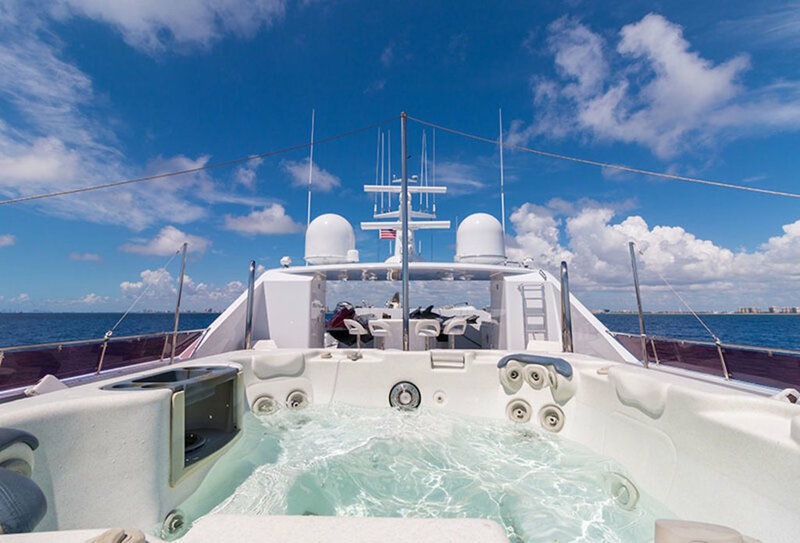 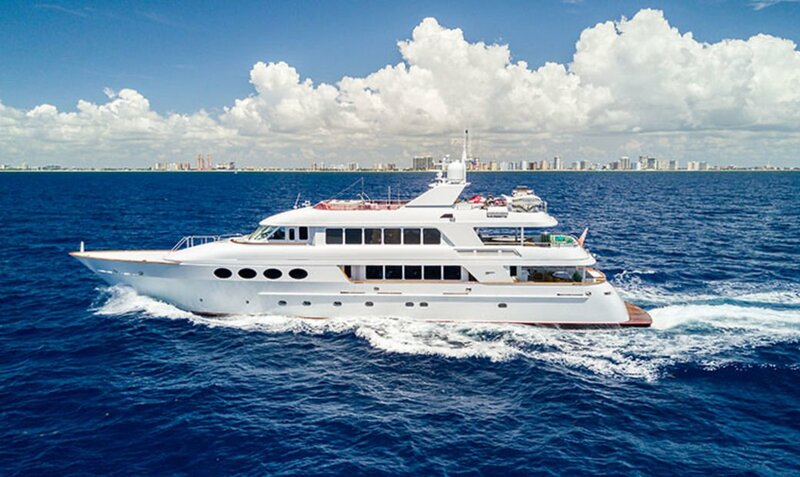 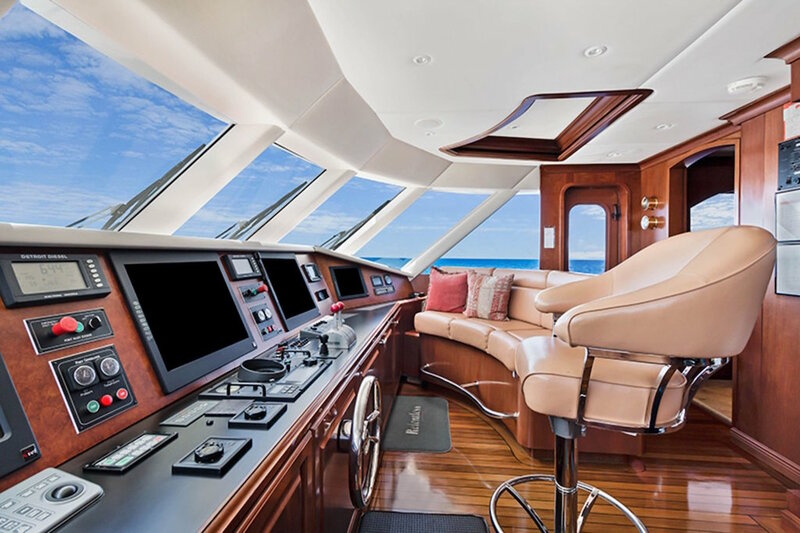 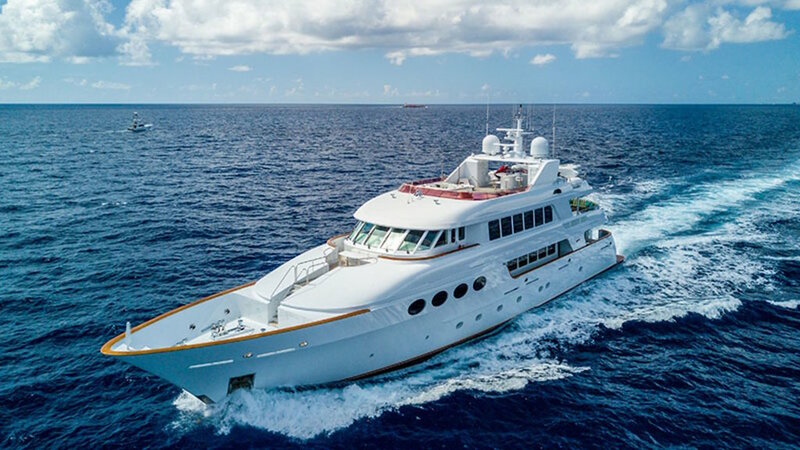 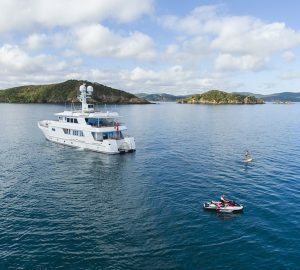 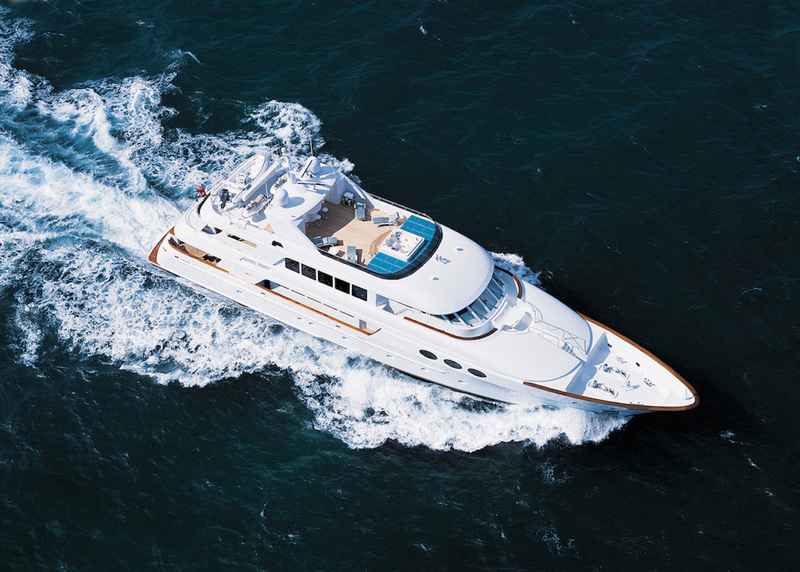 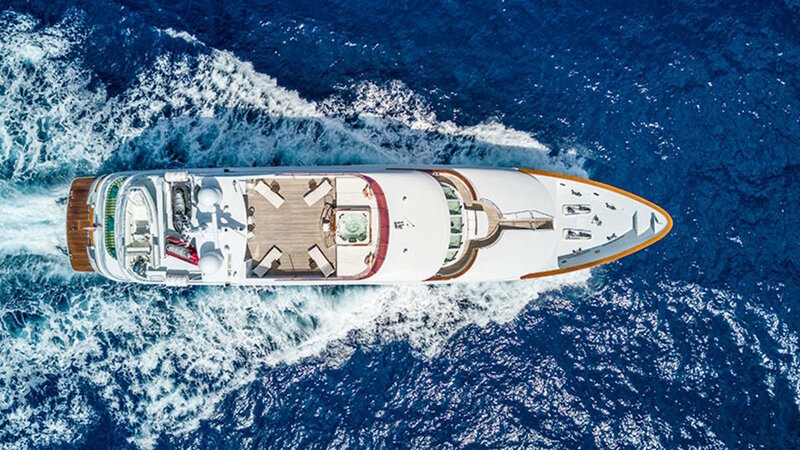 Motor Yacht RELENTLESS combines elegance and comfort with modern systems including Quantum zero speed stabilizers, first-rate audio-visual systems, modern communications systems including WIFI internet and V-Sat plus a whole host of water toys and a professional crew of nine. 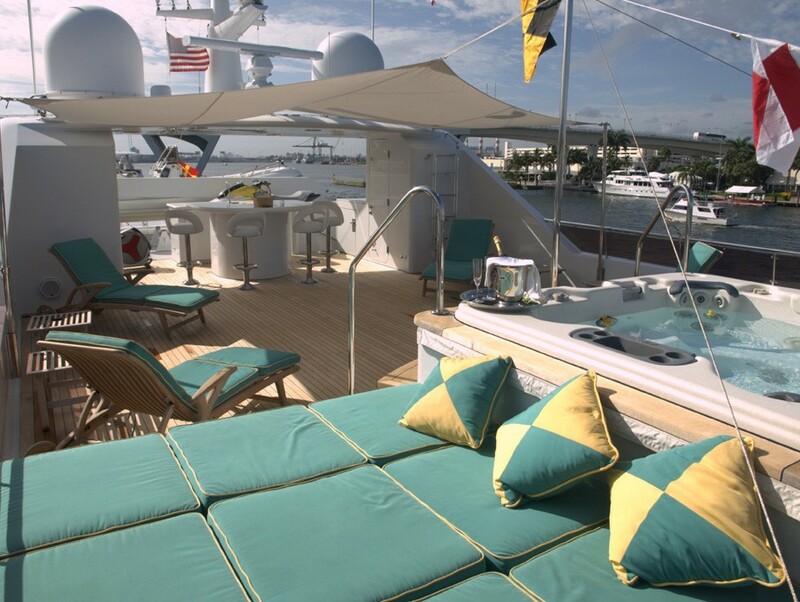 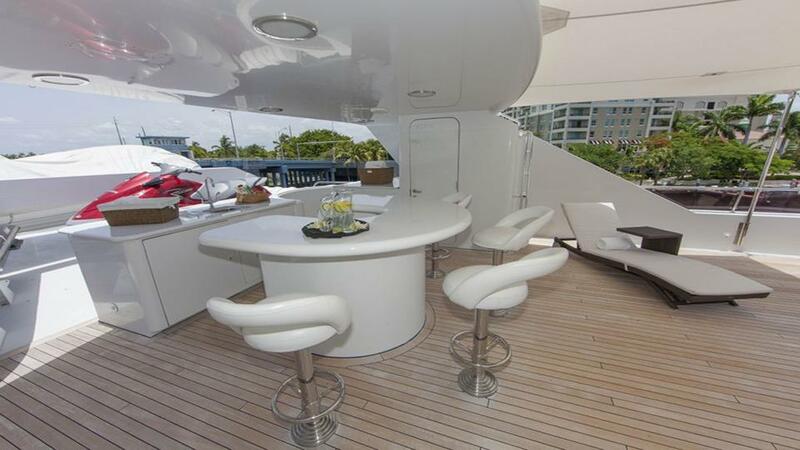 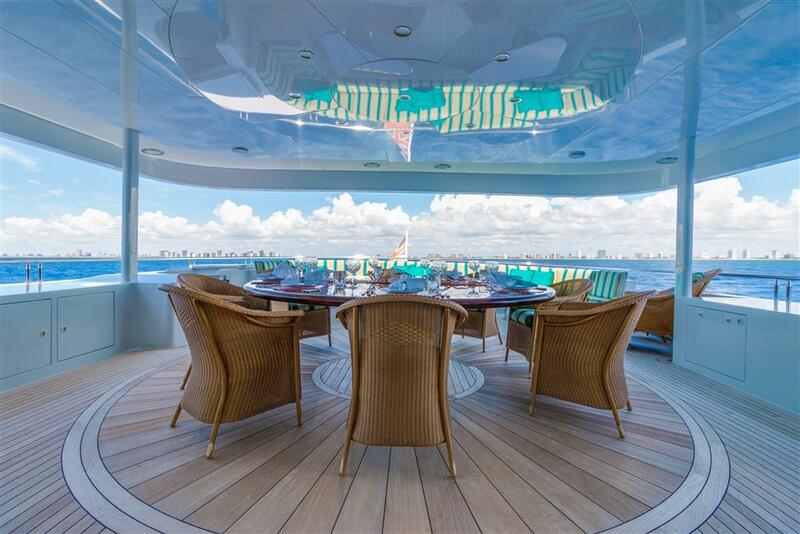 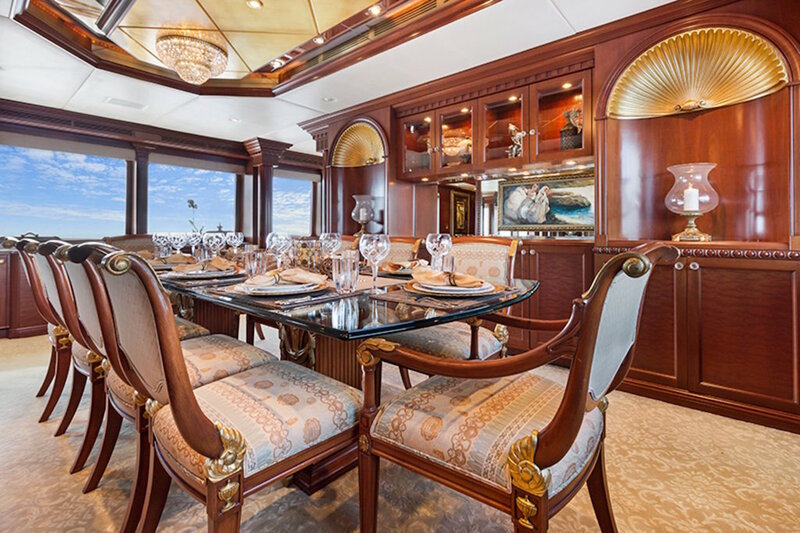 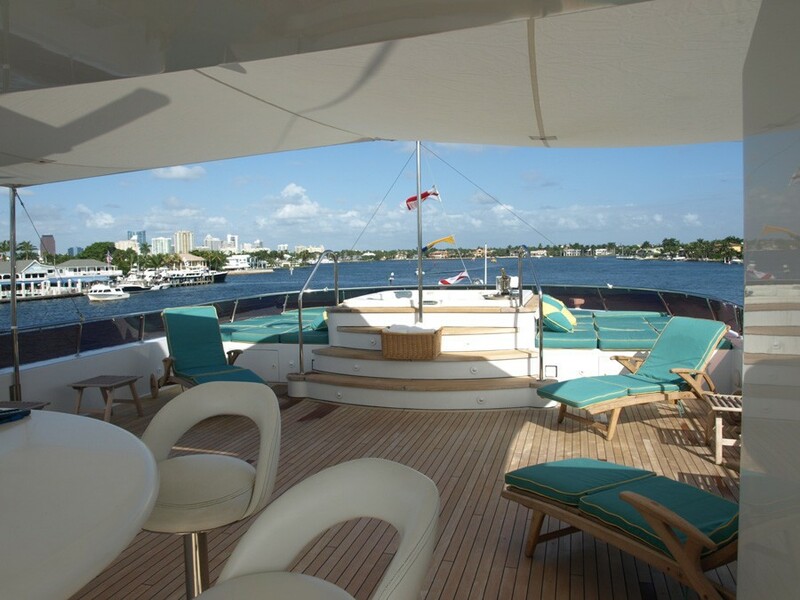 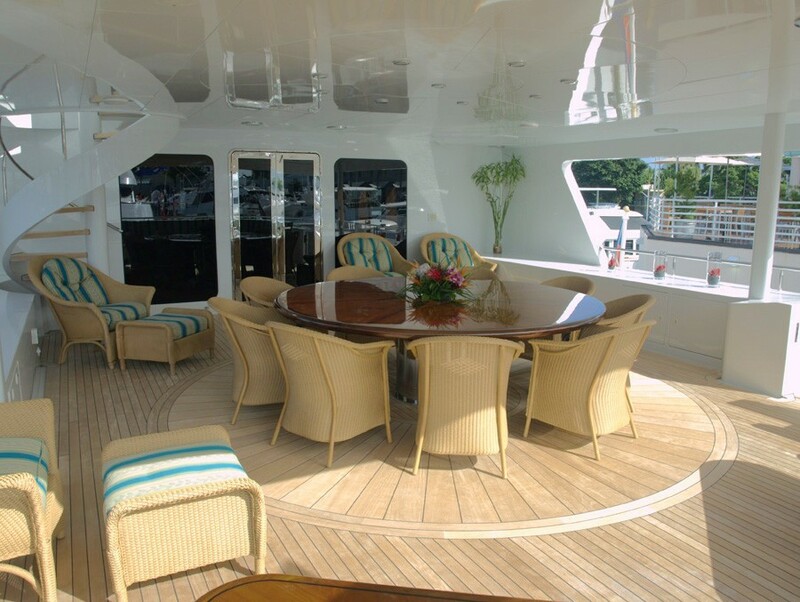 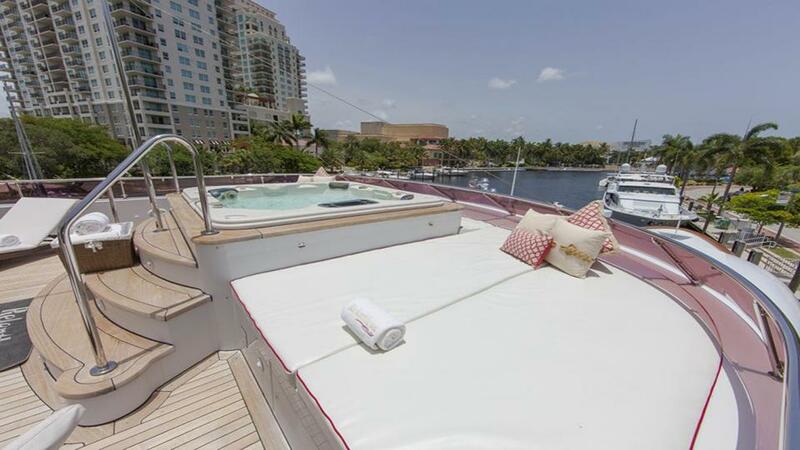 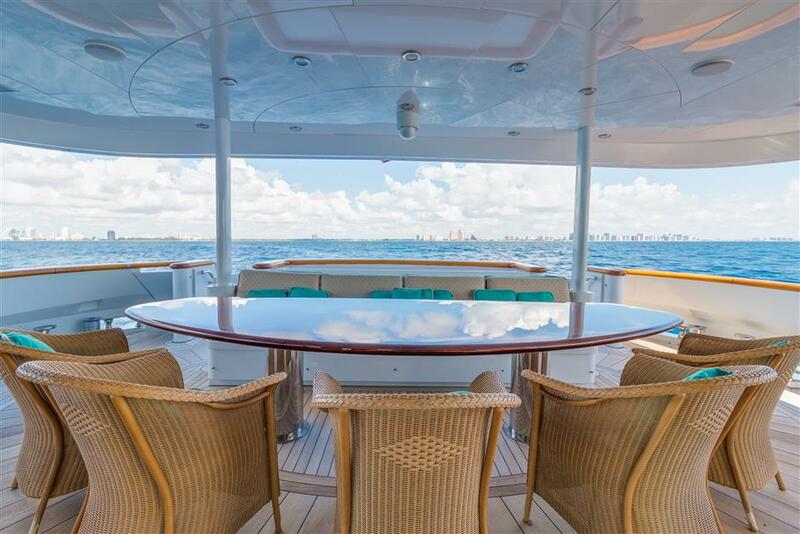 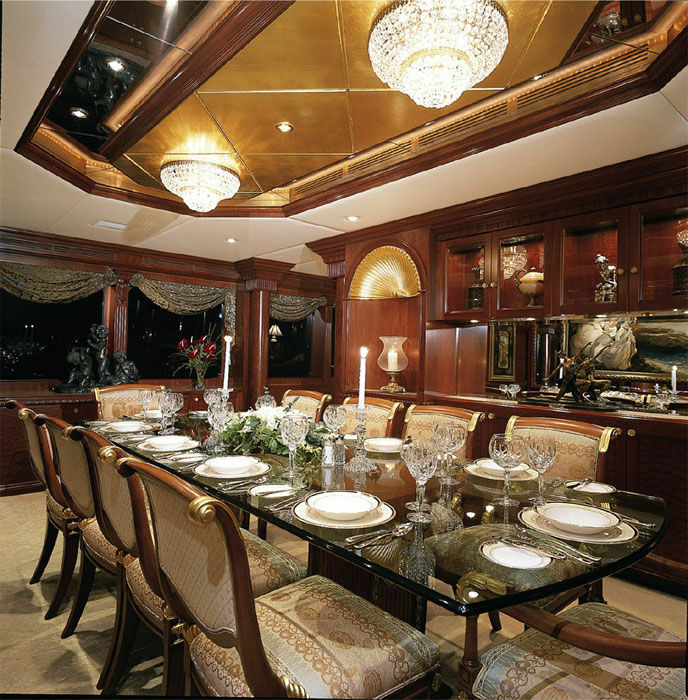 There is a spacious alfresco dining for 8 to 10 guests on the main aft deck. 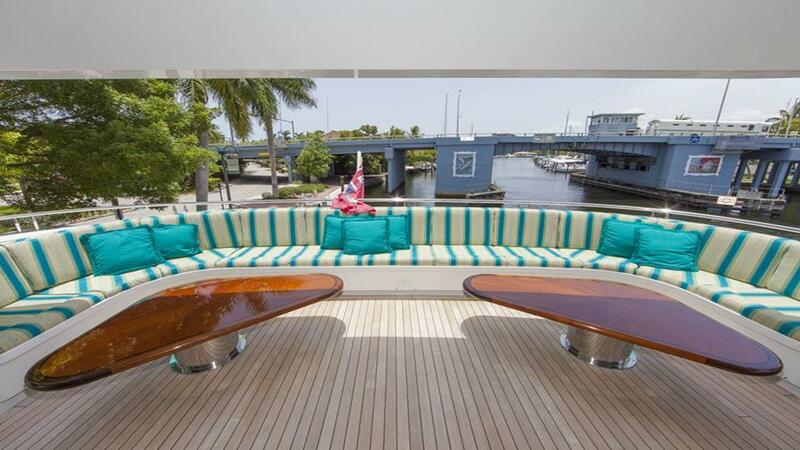 This area benefits from retractable glass to make it comfortable during all weather conditions. 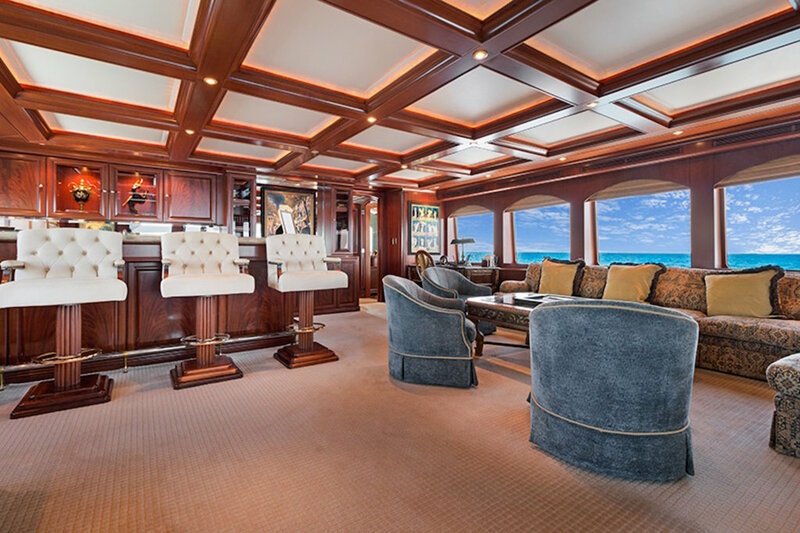 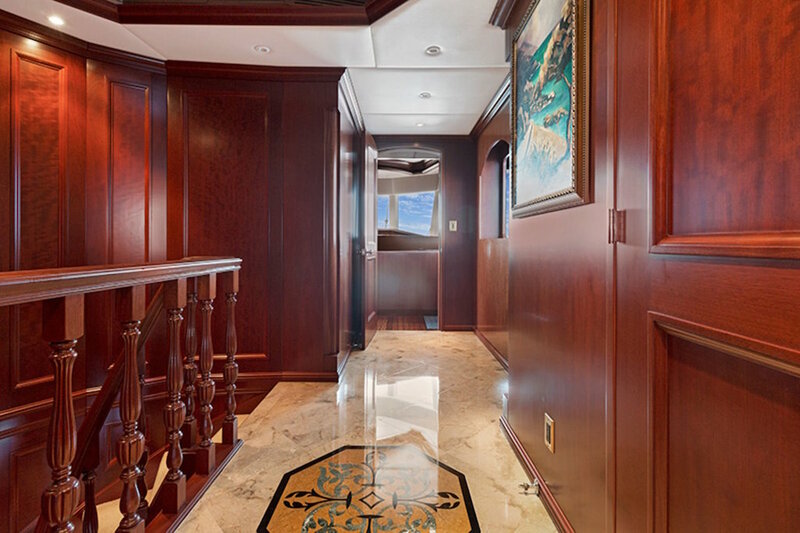 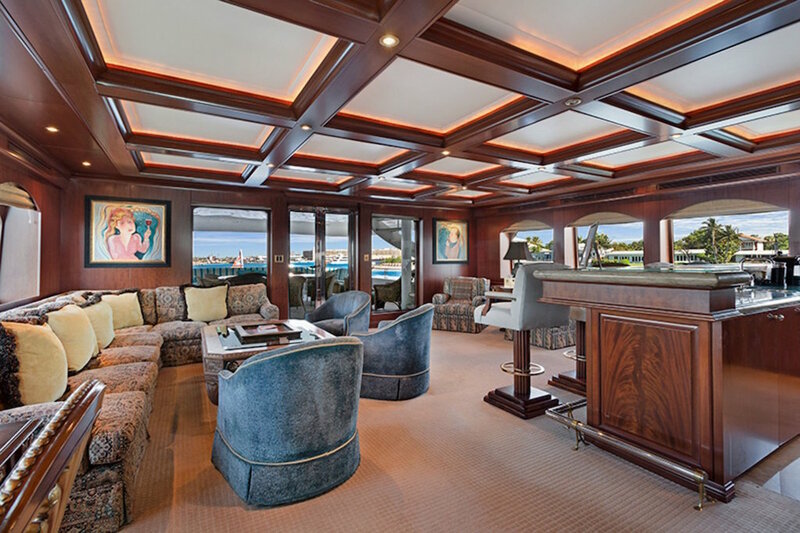 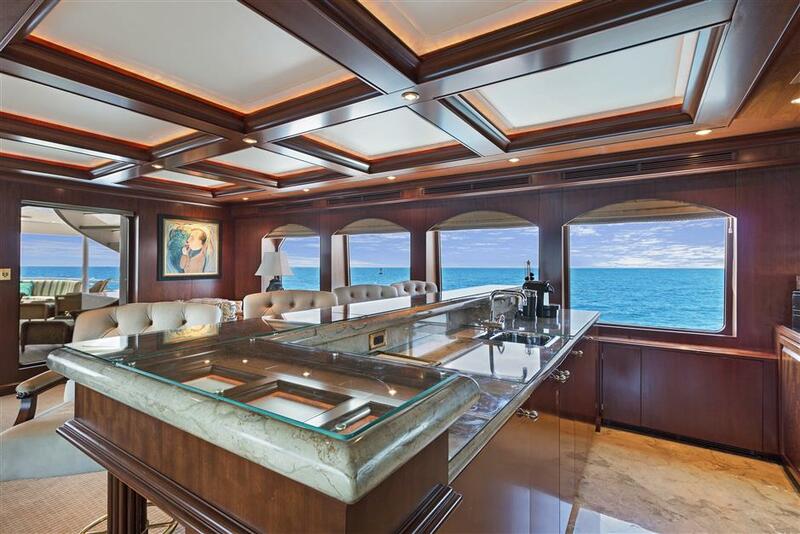 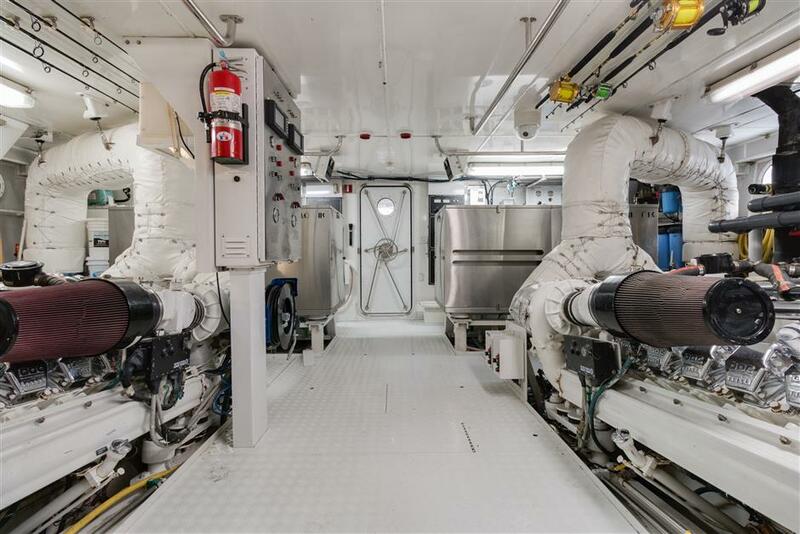 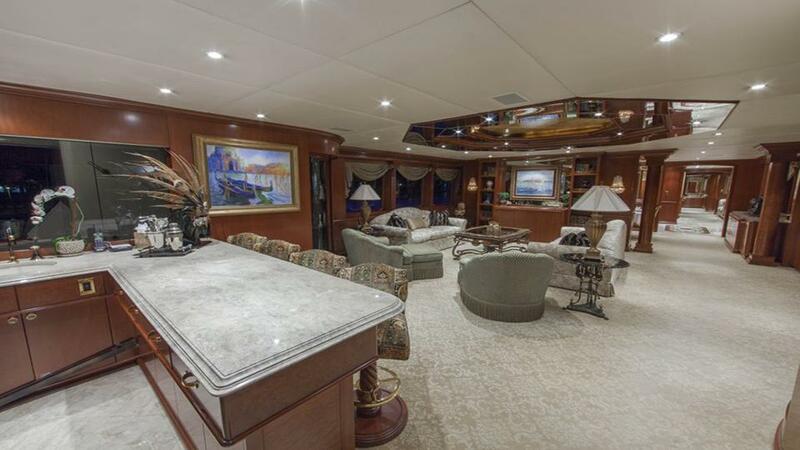 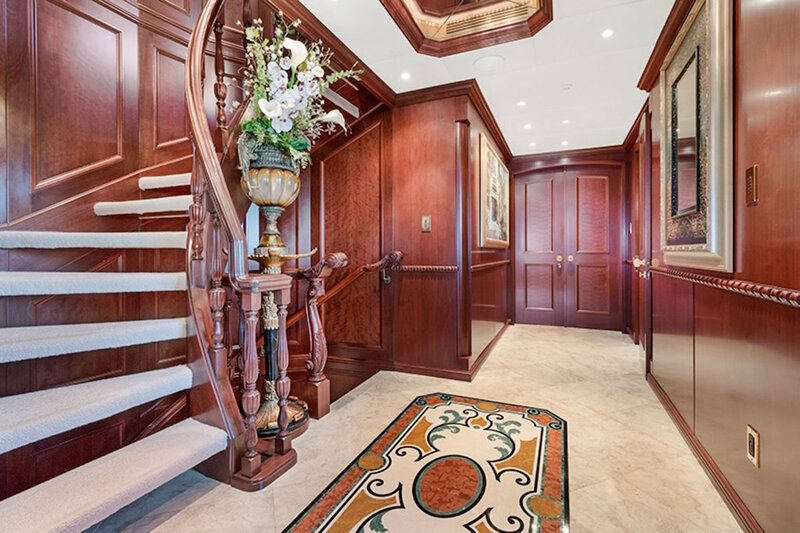 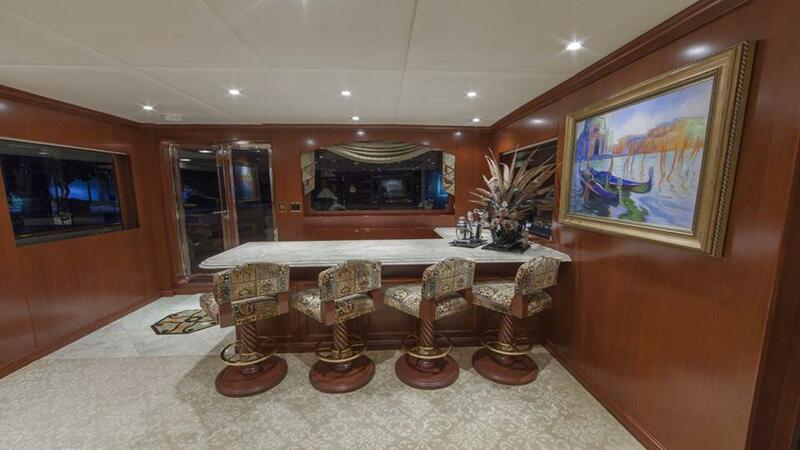 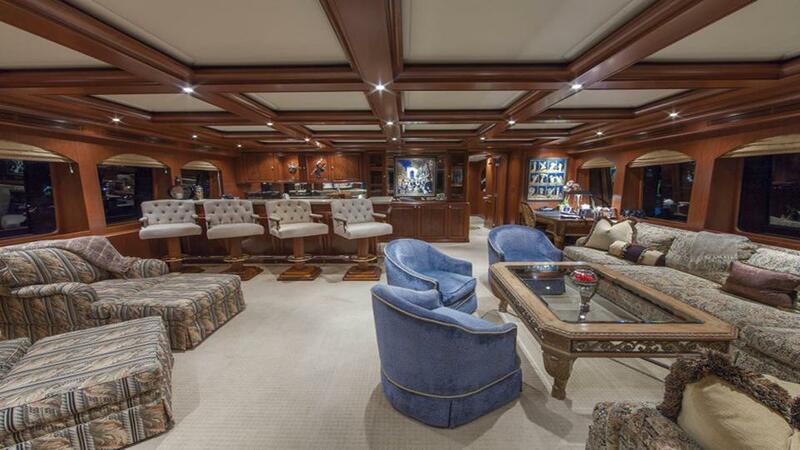 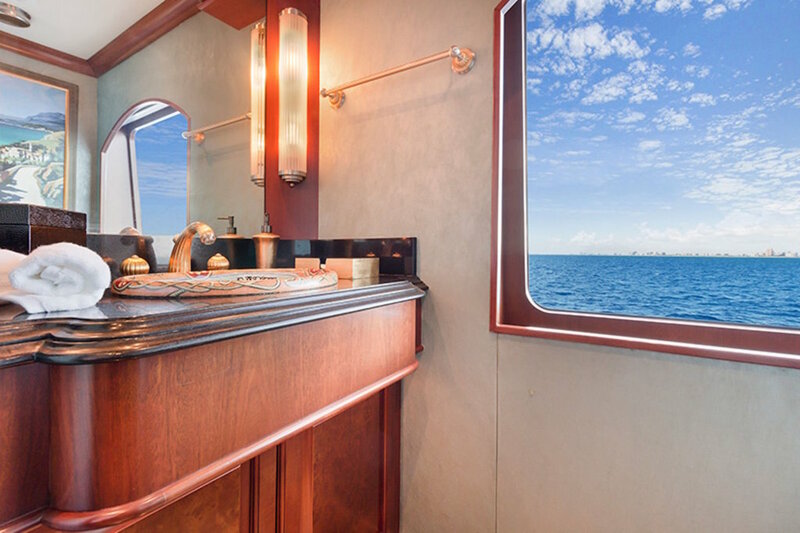 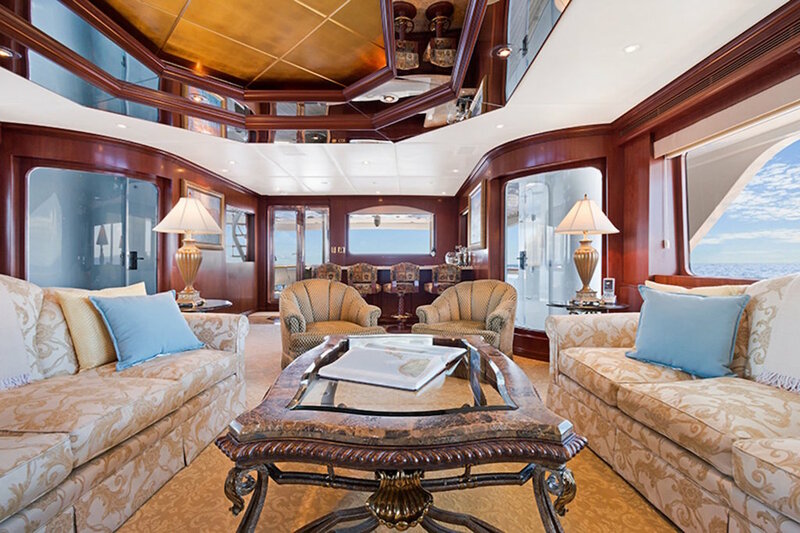 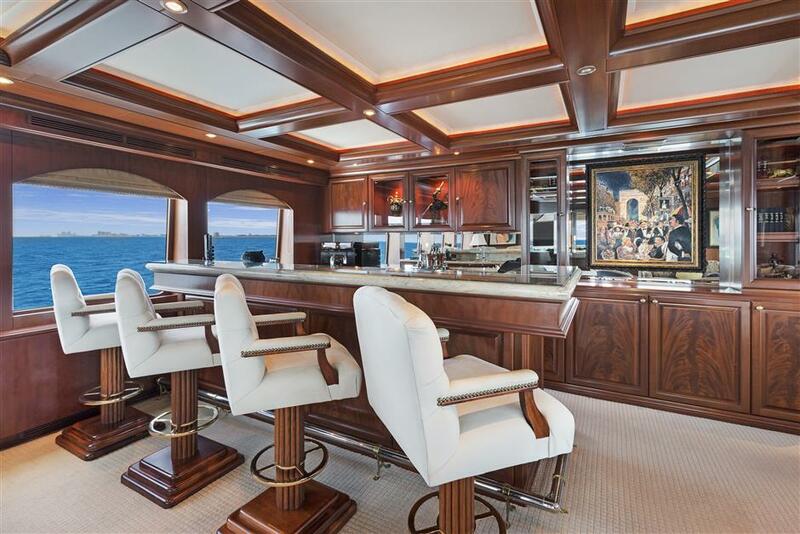 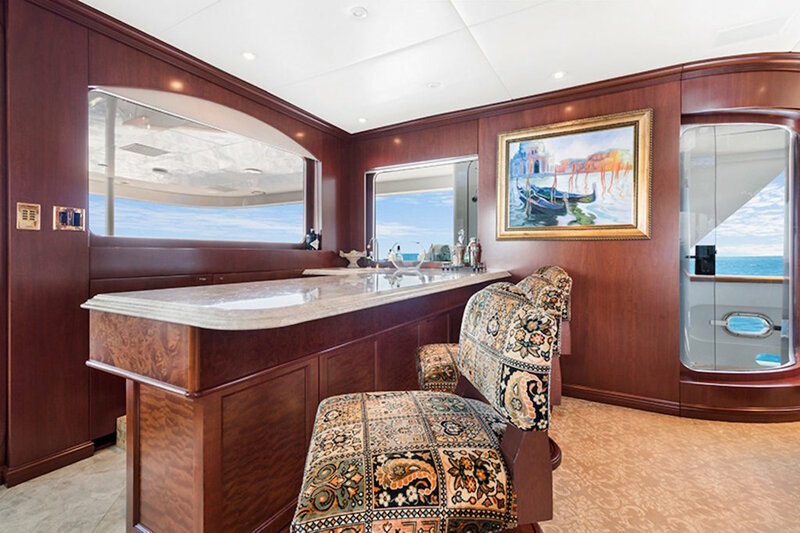 Through the main deck doors, one enters the salon which is a formal but comfortable lounge area with entertainment facilities, a bar, and a formal internal dining room. 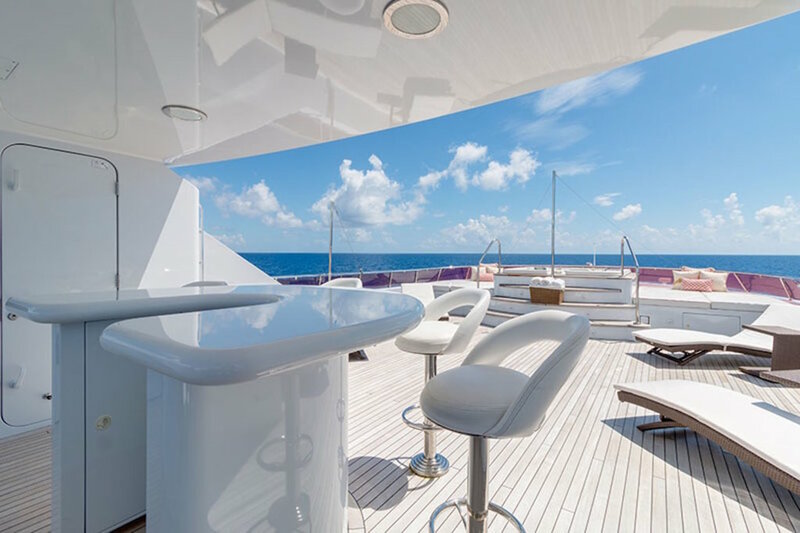 On the upper deck, there is a more relaxed sky lounge with a bar and full entertainment facilities including satellite TV, DVD and a complete sound system including a CD Stereo with iPod docking and a Jukebox. 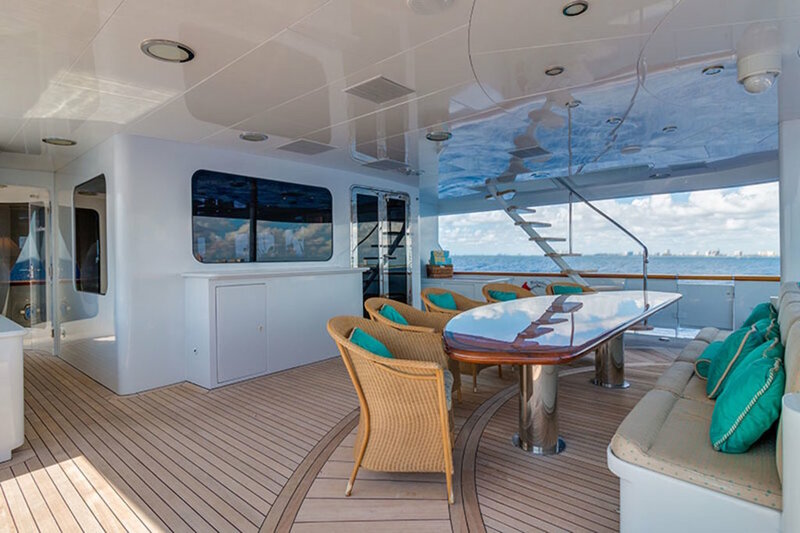 A second alfresco dining area is available on this bridge aft deck, and this is ideal for charter guest who prefers a little privacy. 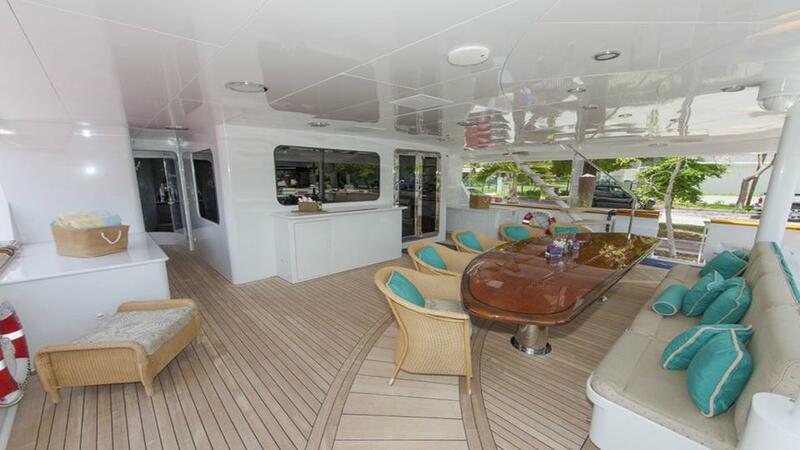 The upper deck is the sun deck which is a great place to spend the day around the Spa Pool pool. 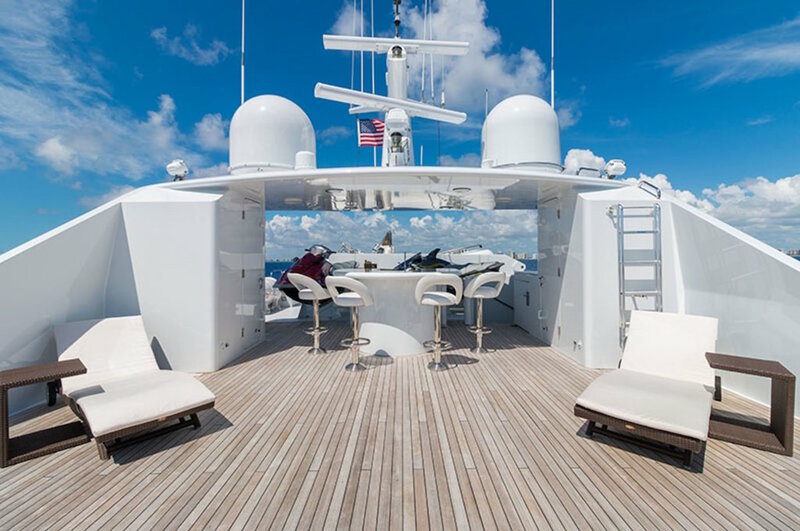 Other equipment on this deck includes sun loungers, a day head, and bar plus a range of exercise equipment including a stationary bike and a treadmill. 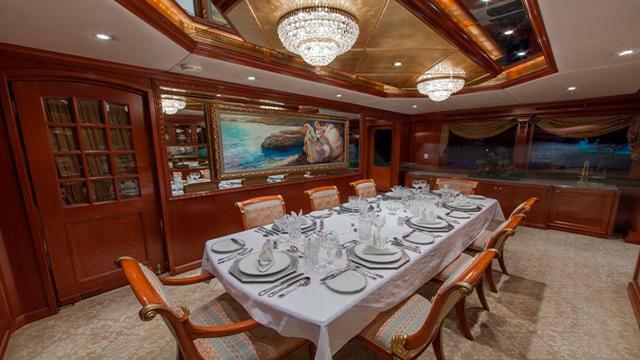 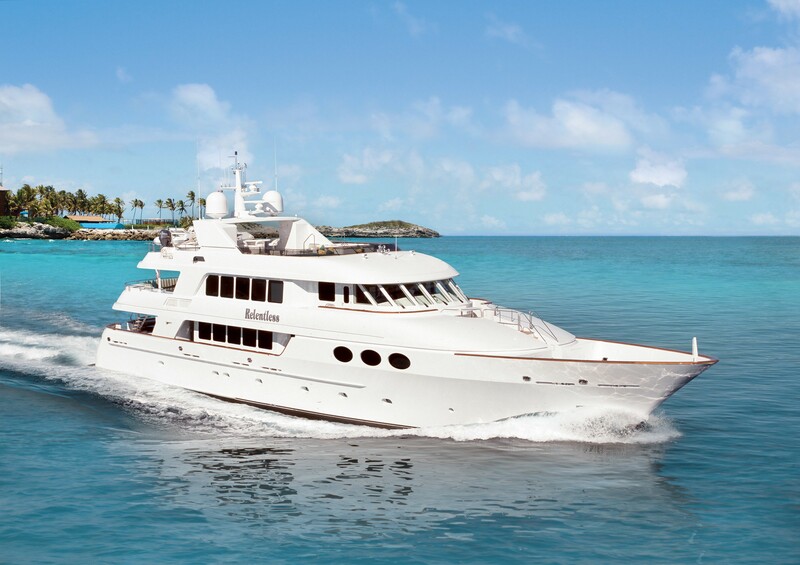 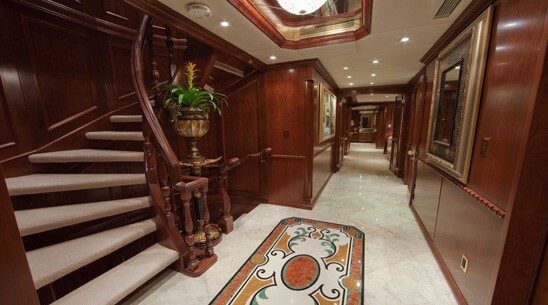 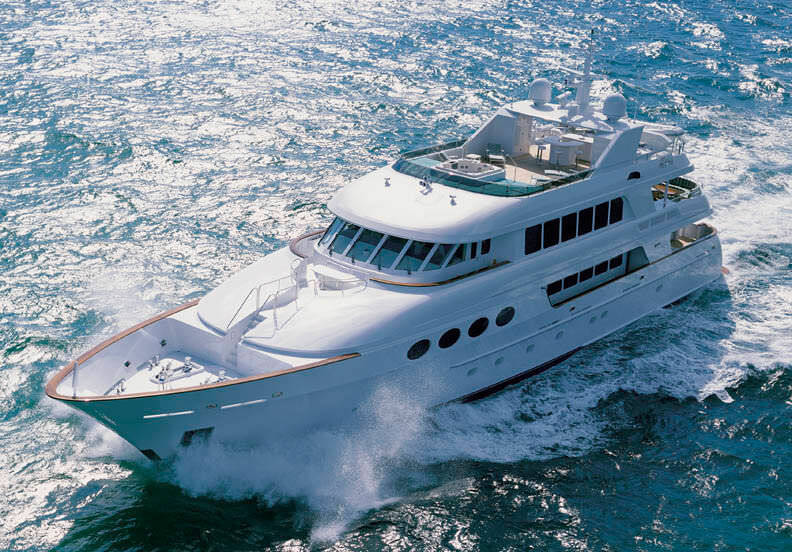 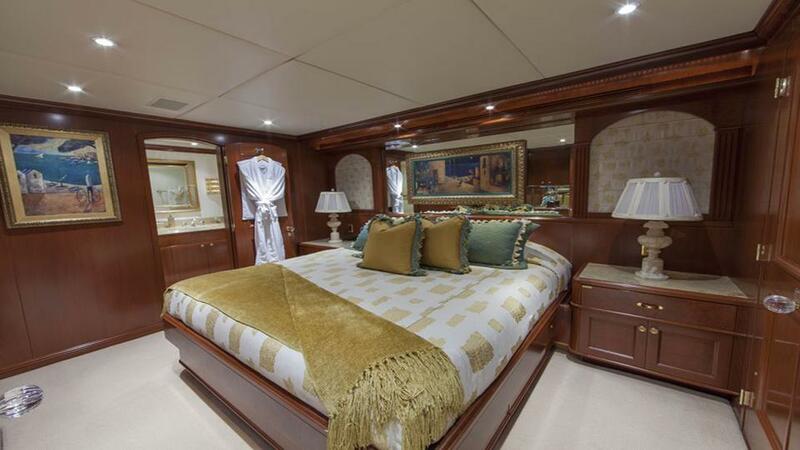 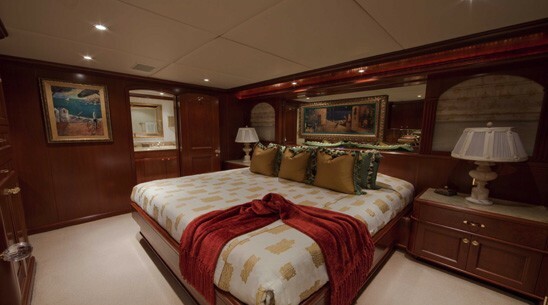 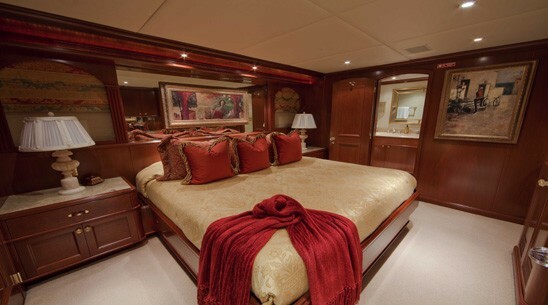 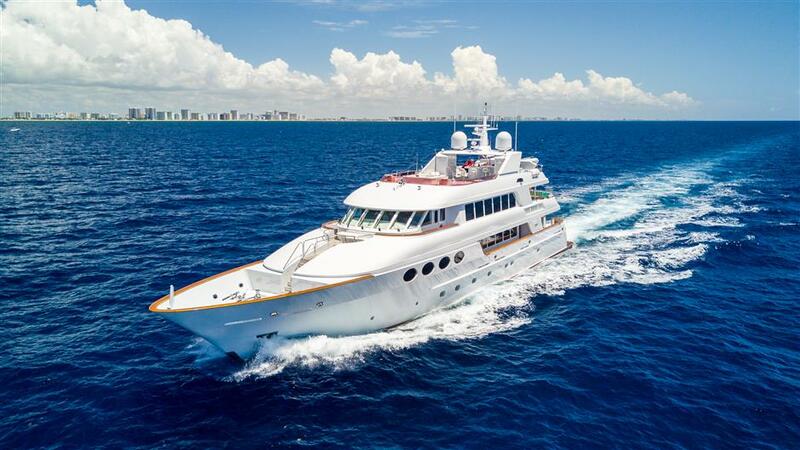 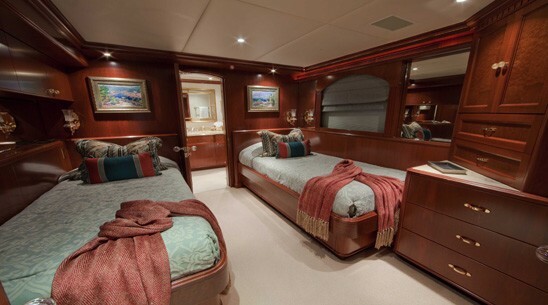 Luxury Motor Yacht RELENTLESS offers luxurious accommodation for 10 guests in 5 staterooms. 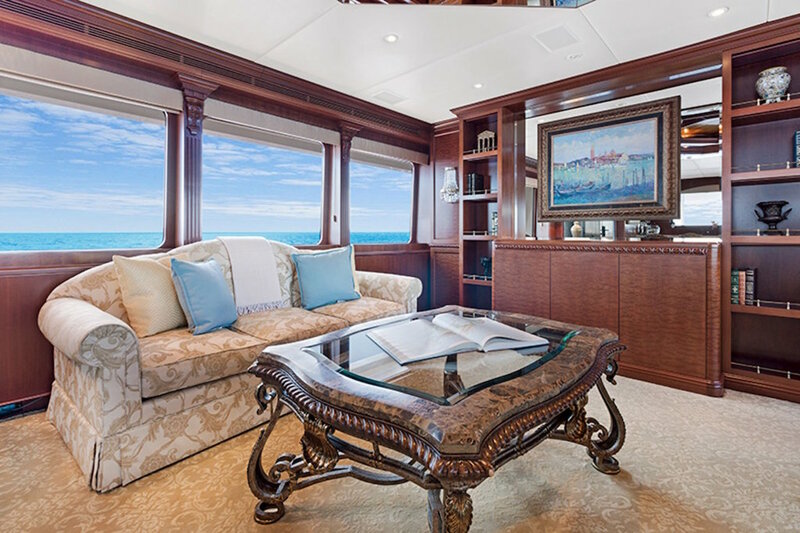 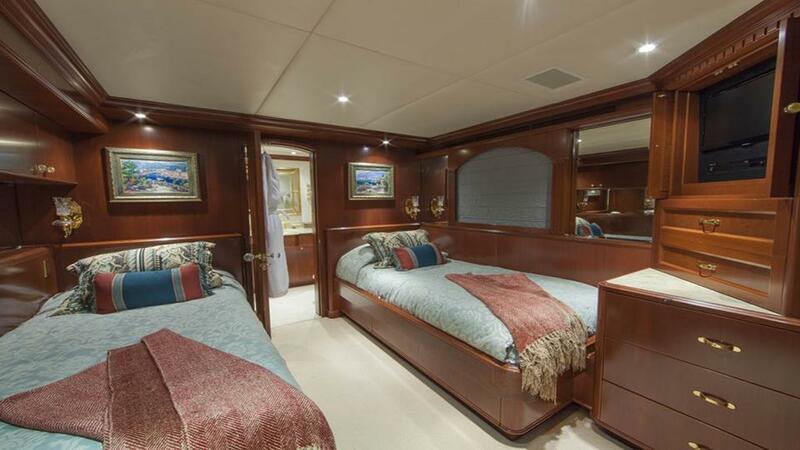 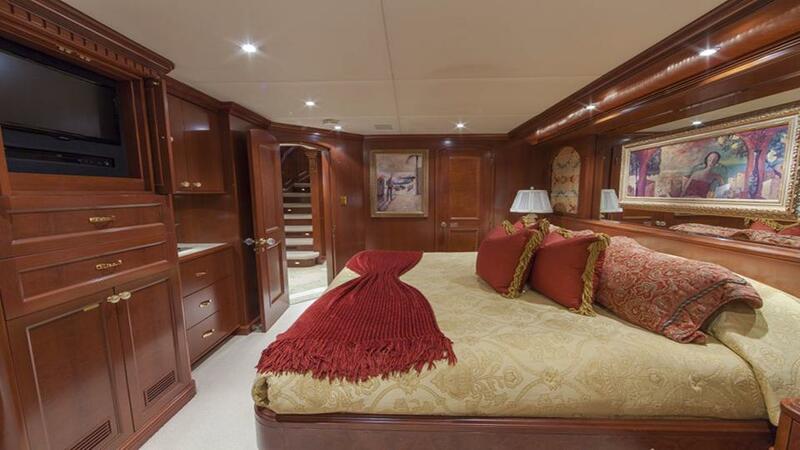 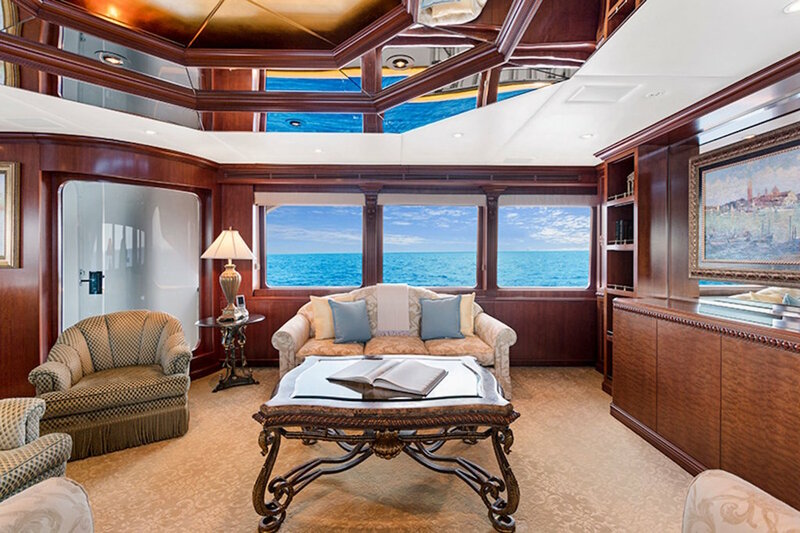 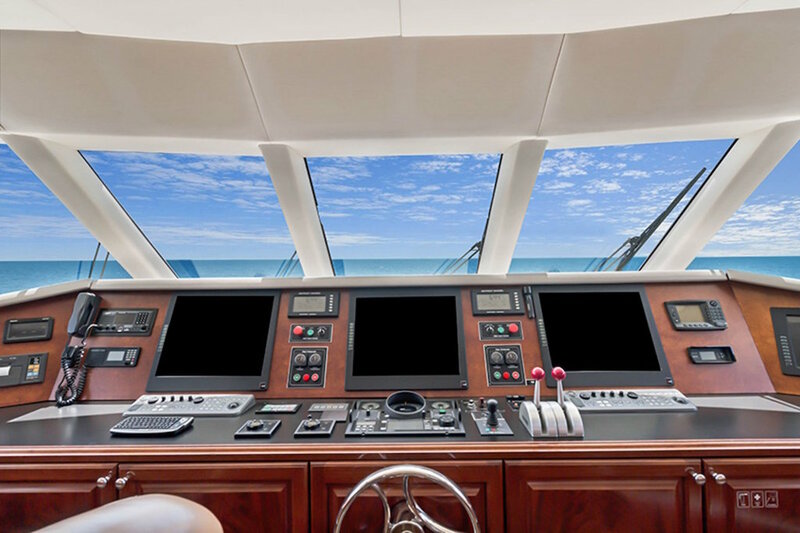 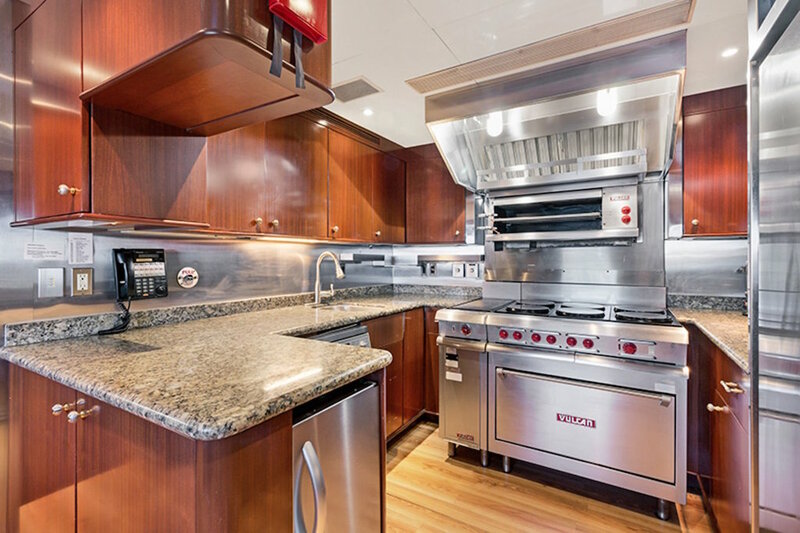 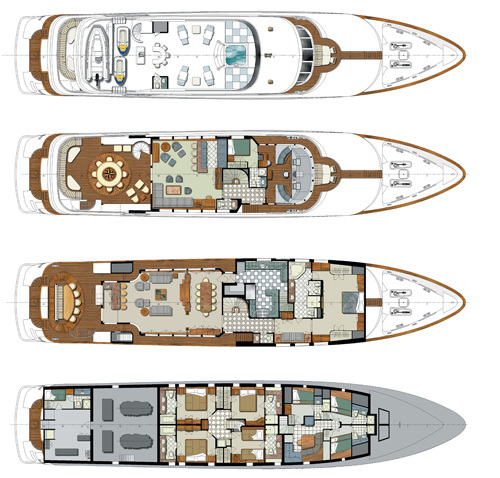 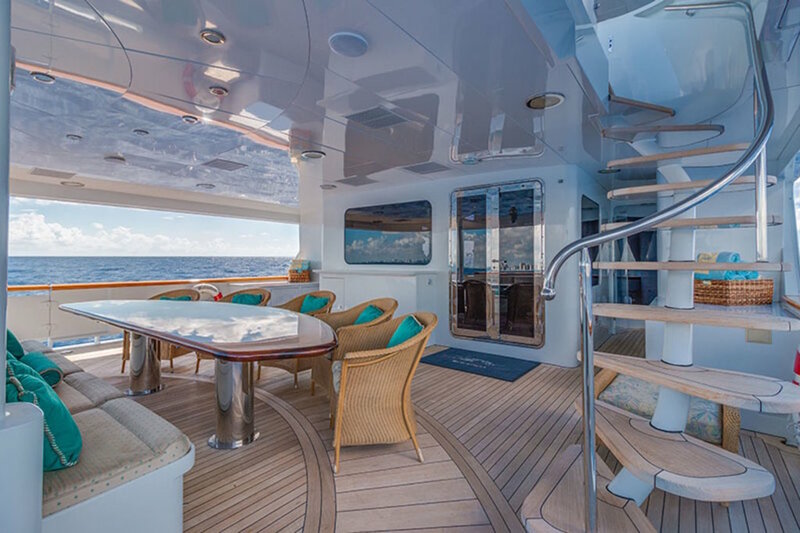 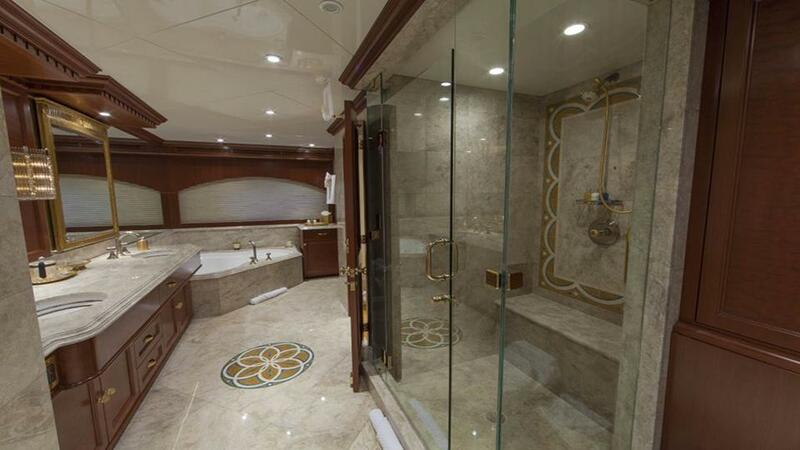 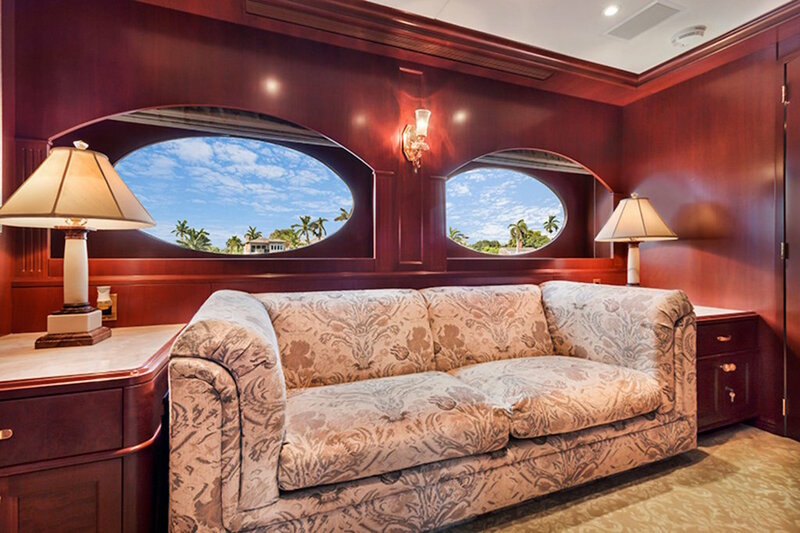 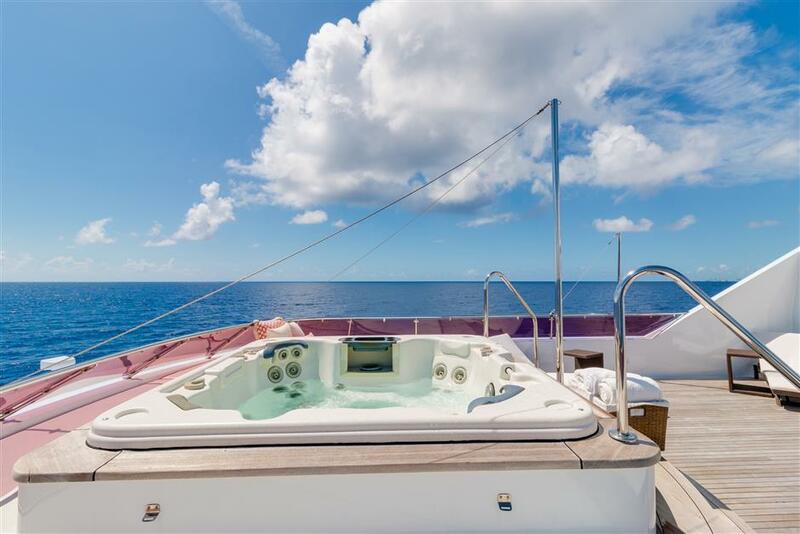 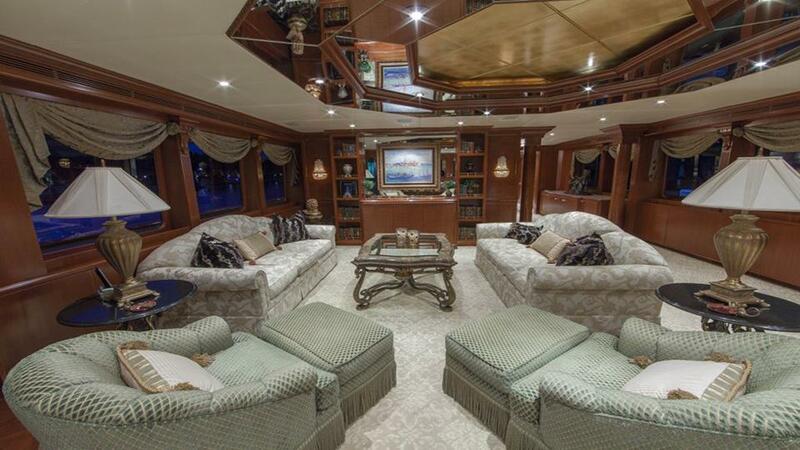 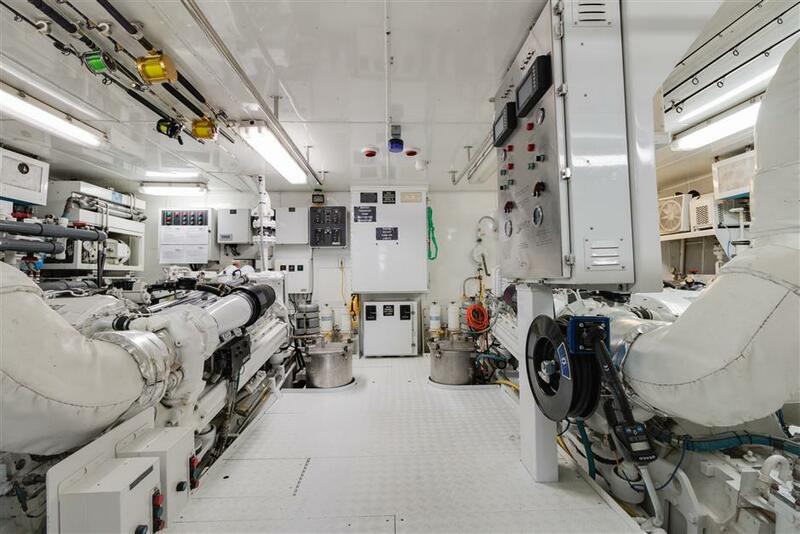 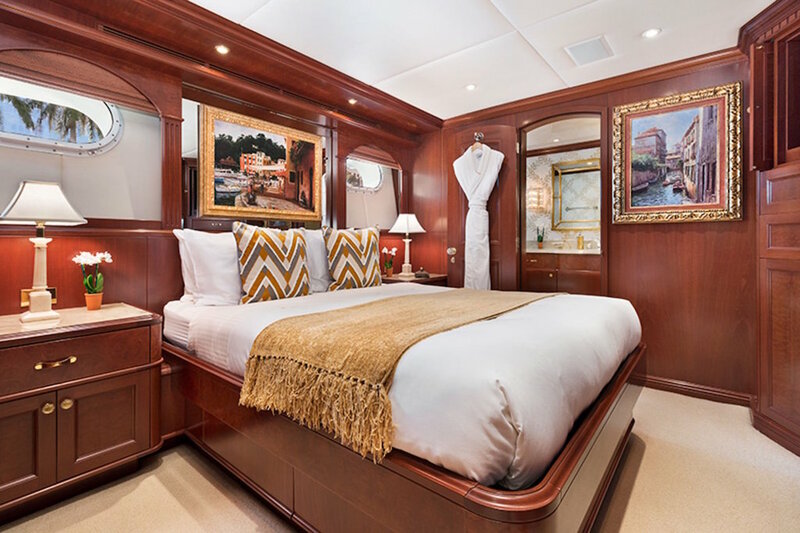 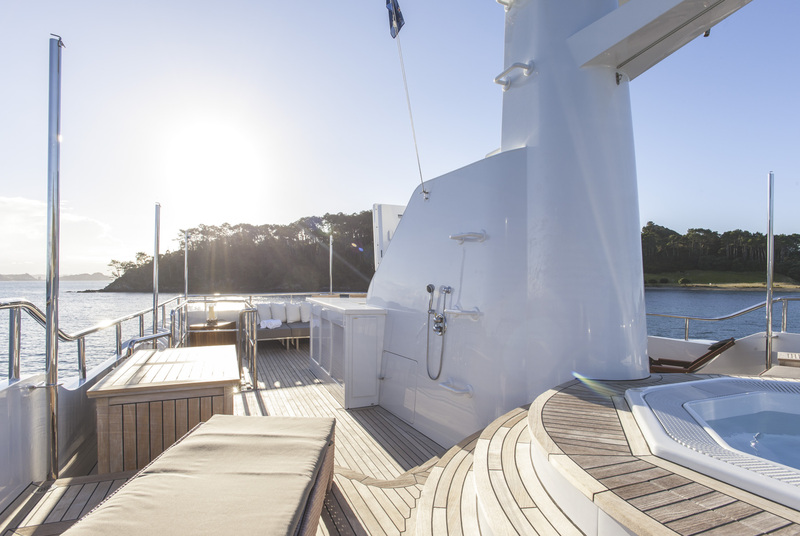 The master cabin benefits from large amounts of natural light from her position on the main deck. 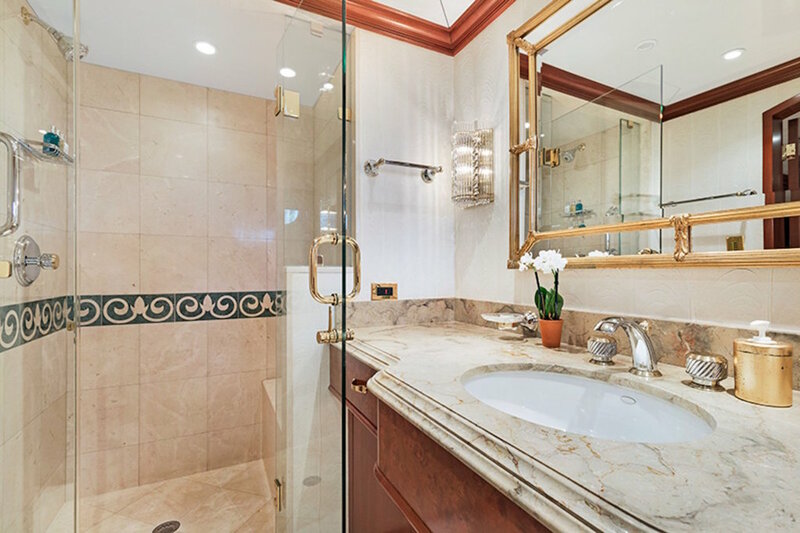 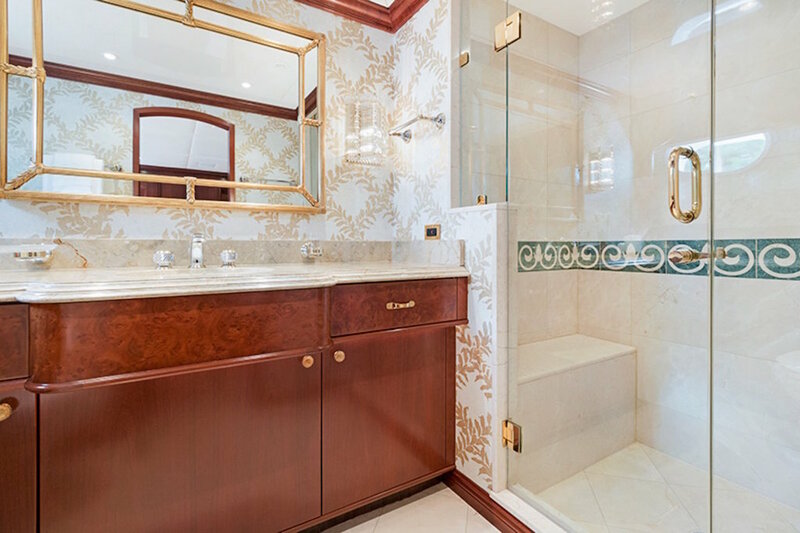 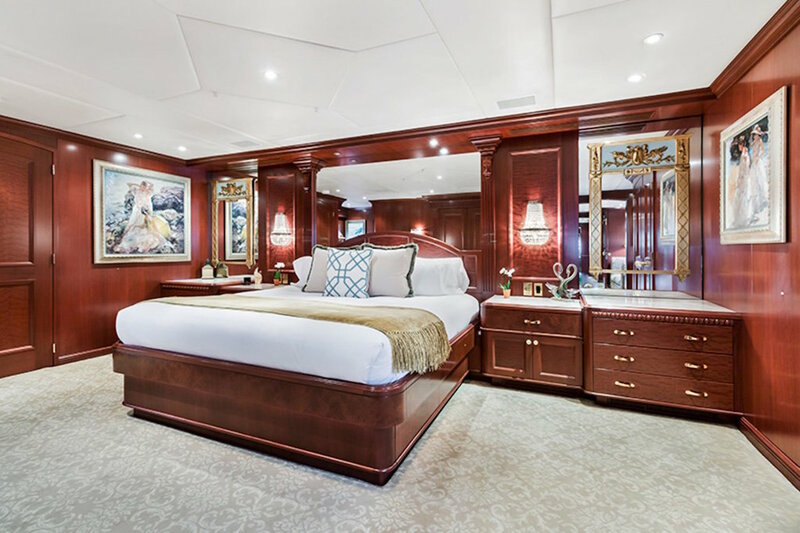 She has a king sized bed, a private office, an entertainment system and a private ensuite bathroom with his and her facilities including a Spa Pool tub and large shower. 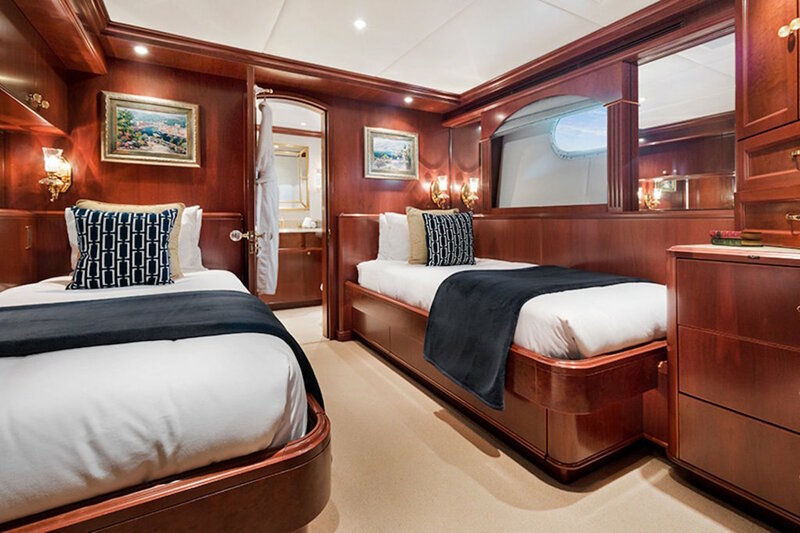 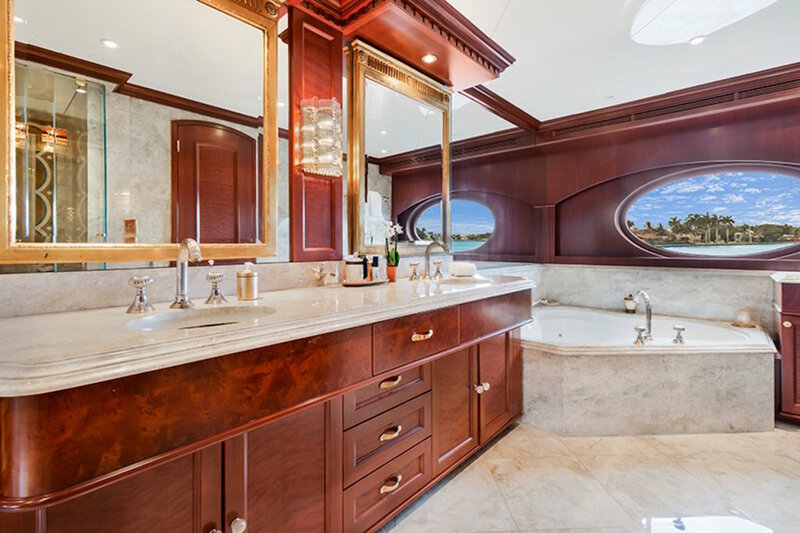 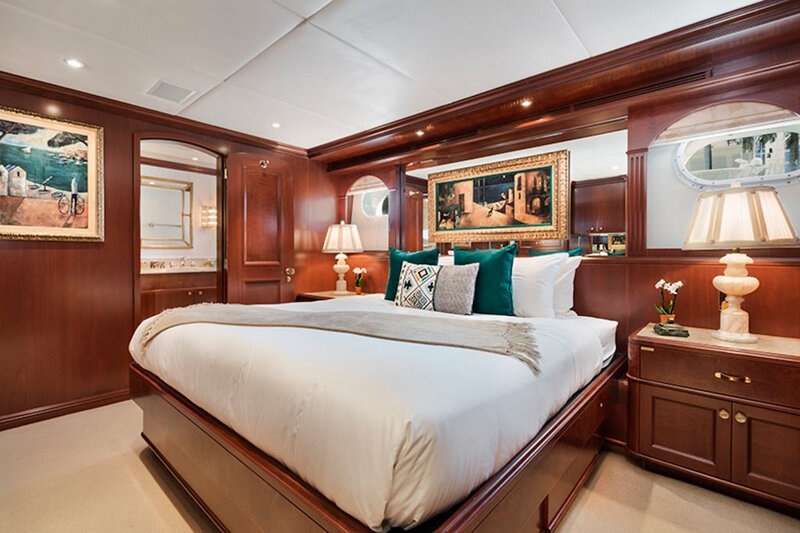 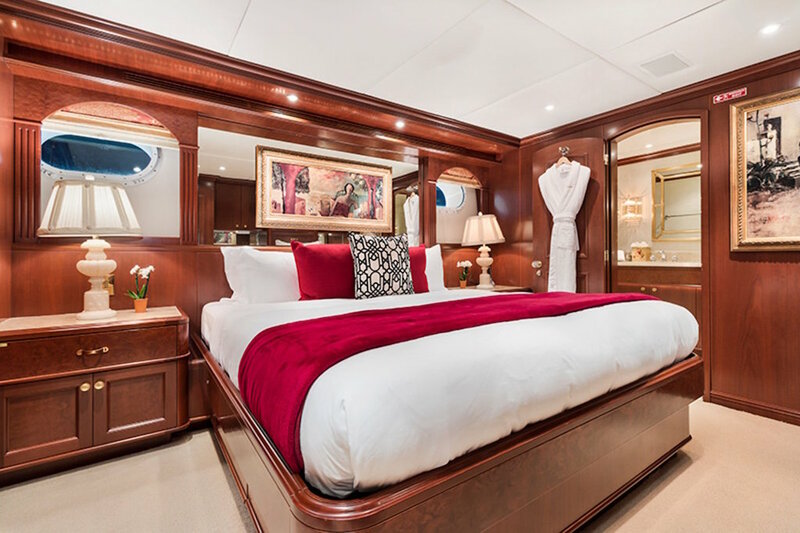 The 4 other guest staterooms consist of 2 kings, 1 queen and 1 twin – each with the same excellent facilities including private ensuite bathrooms and entertainment systems. 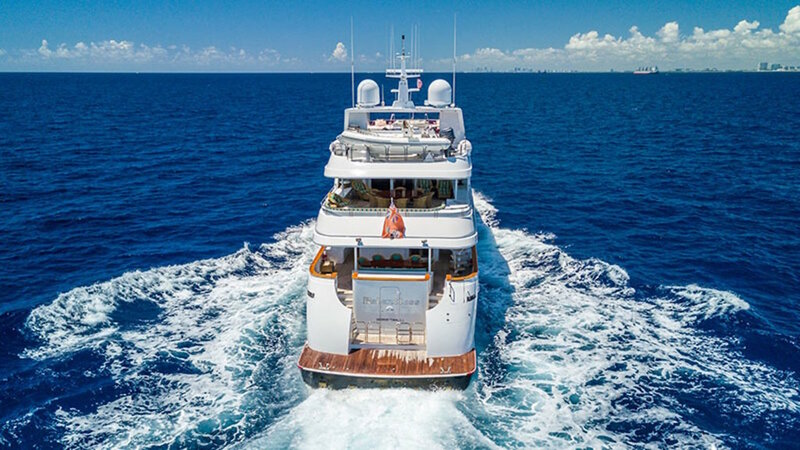 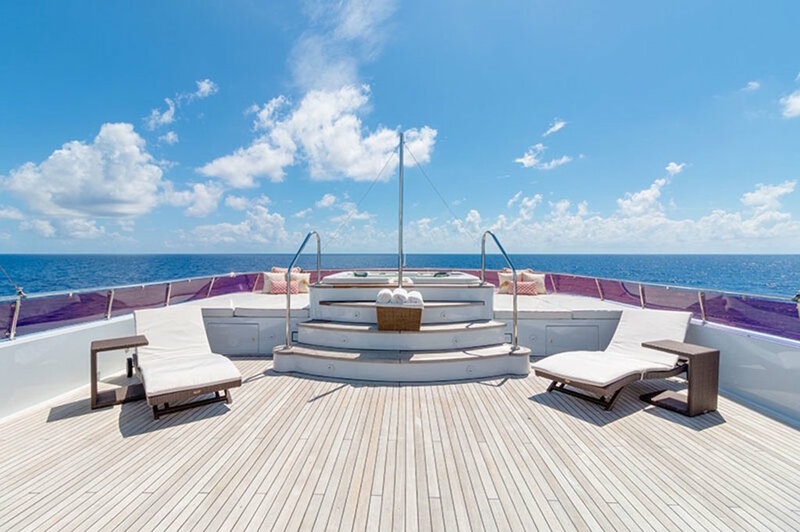 Luxury Motor Yacht RELENTLESS is equipped with a full range of facilities for fun in the Bahamas, the Caribbean or the Mediterranean. 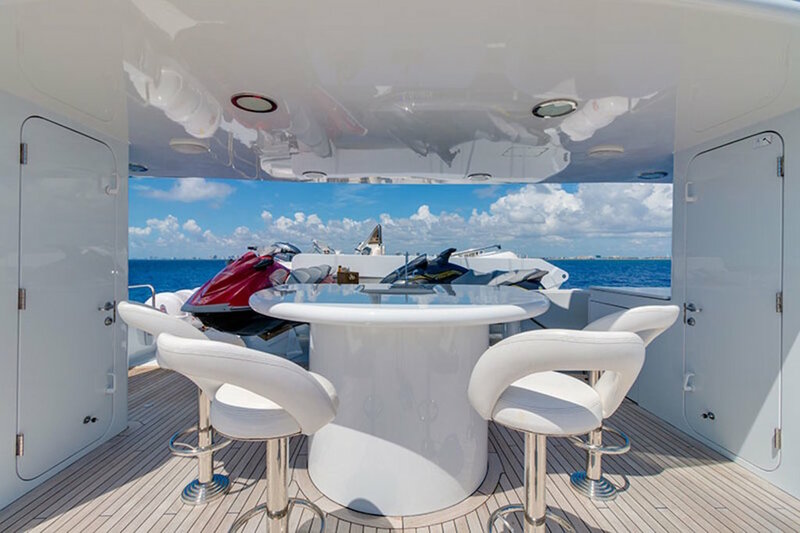 RELENTLESS has two large tenders including a 29' Intrepid sports boat with 2 Yamaha 225 hp outboards which are fully equipped for fishing and a 17' Novurania with 115 hp engine. 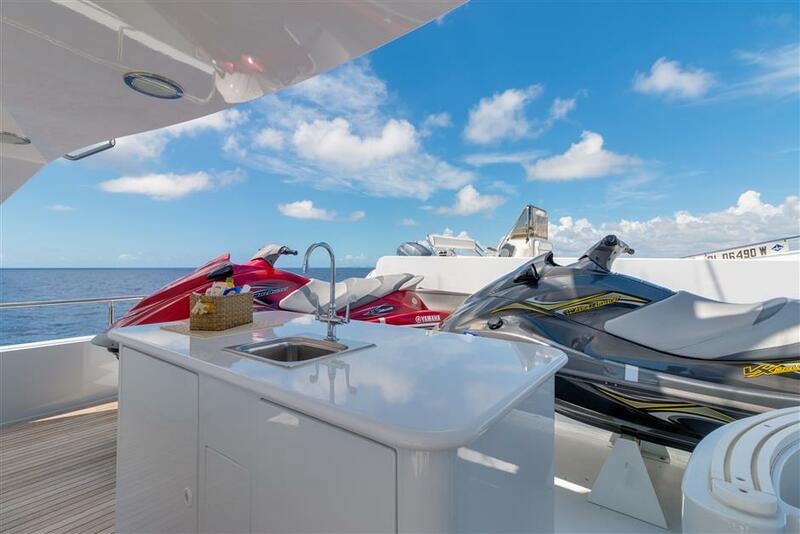 Water toys include 2 x 2 man wave runners, a range of towable including a wakeboard, a kneeboard, waterskis, a range of inflatable toys. 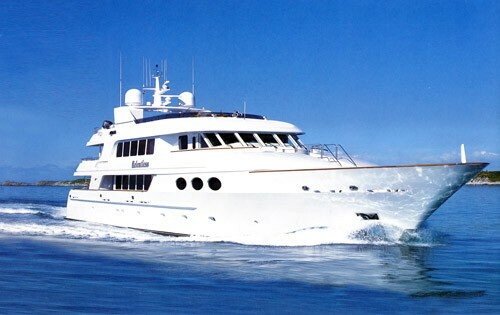 There is also snorkelling gear and a range of board games.